Until I talked with Dr. Tom Kon, Southeastern Apple Research Specialist at the Mountain Horticultural Crops Research and Extension Center in Mills River, NC, “apple orchard” meant my grandfather’s orchard planted by his great-grandmother in the 19th century. When I was a child in the 1950s, its gracious canopies were producing varieties like ‘Melba,’ ‘Yellow Transparent,’ ‘Macoun,’ and ‘Worthy.’ But today, thanks to Dr. Kon’s research, apple growing has advanced far beyond my memories. Dr. Kon spends 80 percent of his time researching new varieties and methods of growing apples and 20 percent of his time on Extension, working closely with North Carolina, South Carolina, and Georgia apple growers. Q: What is the biggest challenge facing apple growers? A: One of the greatest challenges our growers face is a growing labor shortage. Apple production requires significant labor inputs throughout the growing season and there are uncertainties regarding reliable access to a legal workforce. 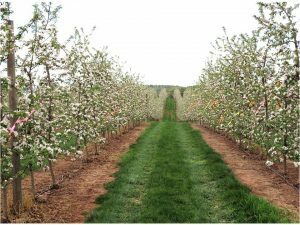 As a result, more apple growers are adopting high density orchard systems that lend themselves to mechanization and automation. Q: What do you mean by a high-density system? A: It means planting a greater number apple trees per acre (about 800 to 1,200). What makes this possible is improved dwarfing rootstocks that have profound effects on tree growth and productivity. As part of a regional rootstock research project, we (Dr. Mike Parker and I) are evaluating the performance of over 30 apple rootstocks at the Mountain Horticultural Crops Research and Extension Center here and in Blairsville, Georgia. Q: What are the benefits to growers? A: Planting a greater number of trees per acre on dwarfing rootstocks results in greater yields in early years, less complex canopy architectures with improved light distribution, improved fruit quality, and improved land use efficiency. Those large, hulking apple trees that your grandfather grew were lovely, but needed 5 years or more before they produced a crop. Dwarf trees can produce a crop in two or three years, depending on the variety. For the apple grower, that means a much quicker return on the investment. Q: What kind of investment are you talking about? A: Establishment costs of high density orchards are relatively high due to tree number, tree support systems, and irrigation. These inputs can exceed $15,000 per acre. However, many of these costs can be recovered early in the life of the orchard, due to the higher value of early production and improved fruit quality. Q: What kind of equipment is used in high density orchards? A: Until recently, the major innovation in apple harvest technology occurred when we switched from wooden to metal ladders. Ladders can be dangerous, particularly in an orchard where the ground is uneven. 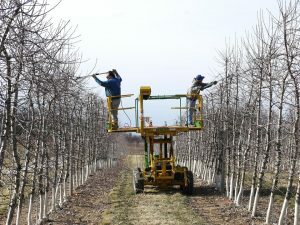 The adoption of high density orchard systems has resulted in the development of labor saving technologies, such as mobile labor platforms, that improve worker safety. 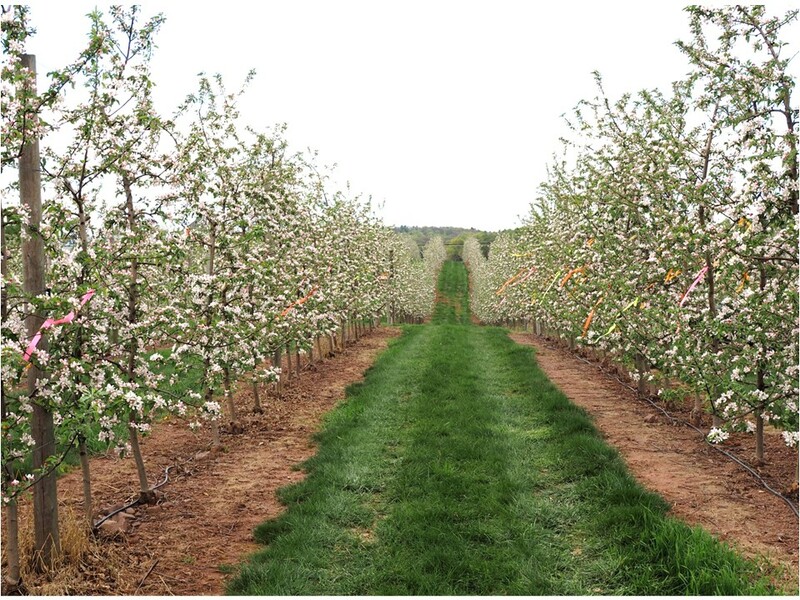 Modern orchard systems are compatible with new technologies, reduced use of pesticides, and increased production. To find out more about the work of Dr. Tom Kon and his team, visit the Mountain Horticultural Crops Research and Extension Center website throughout the year.